New England skiing is some of the best in the country. The New England region of the United States offers various types of skiing and has a long ski season, in some areas extended to May. Locals and travelers from around the world enjoy this ski season. Skiing in New England is readily available. The conditions for skiing in this region do vary widely from day to day. Due to the weather changes that happen rapidly in this region, no two ski seasons are the same, even from one day to the next. Ice can sometimes plague ski resorts. If you are planning a trip, be sure to contact the resort prior to leaving to ensure it offers quality ski conditions. Maine offers a variety of ski resorts. Sugarloaf and Sunday River Mountains are two popular options for skiing. These are the largest resorts, but smaller locations are readily available. In Maine, all types of skiing are available, including cross-country skiing, extreme skiing and beginner runs. Because the conditions are good throughout the winter and spring season, visitors will find something that fits their needs here. 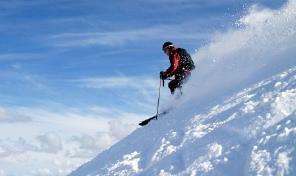 Consider the Camden Snow Bowl Ski Resort, Mt Jefferson Ski area and the Sugarloaf Ski Resort. Another area worth visiting in New England is Vermont, in particular the northern portion of the state. Jay Peaks and Sugarbrush are two of the most popular options with those who come back year after year. Another good option is Burke Mountain, which is a lesser known option offering high quality skiing. Vermont's skiing is some of the best in terms of snow quality and overall experience in a tourism-like setting. This state is known for its scenic views and higher end shopping centers, too. New Hampshire is yet another great choice for skiing, especially for those traveling longer distances since the area is highly travel oriented. Consider an off the beaten path option such as Whaleback Mountain. Another option is Cannon Mountain Ski Resort. New Hampshire skiing offers a great option through late March and into April. Attitash Bear Peak is a good option that is open whenever it is cold enough to turn on the snow making machines. One of the older options is Black Mountain, which has operated as a ski resort for 70 years and still competes with the best resorts in the region. Connecticut is often a state that does not get much attention for being a ski resort area, but it is a good option especially for those looking for something different. The geography here does not allow for the best skiing terrain, but a good option is Mount Southington. Smaller resorts are often better suited for younger skiers here. Massachusetts may not offer the biggest resorts for skiers, but it does have great slopes. Consider Berkshire East ski area or Blue Hills Ski area for good options. One of the biggest differences here is that the cost of skiing, including the costs of lift tickets, is often much less expensive than northern resorts. Another option for those who are looking for great skiing is New England is New York. The state has more than 50 ski resorts offering numerous options for every type of skier. The Catskills Mountains and the Adirondacks are nearby, making for many slopes of various degrees of difficulty. Some of the options to consider include Belleayre, Whiteface Mountain and Titus Mountain. Some areas in New York are more expensive than others are, especially those in the southern portion of the state. New England skiing differs from year to year, but many of these facilities do produce their own snow when the weather conditions are not ideal. Each location is different in terms of what it can offer, such as local lodging, indoor activities and shopping locations. For those who are looking for a lower cost, consider booking a vacation package.